A boy desperate for refuge. A girl unknowingly tied into a revolution. Their paths are set to collide with critical consequences. When Kai finds himself fearing for his life, the only logical reaction is to run. But in a world where escaping south of the river is next to impossible, is it worth the risk? South of the river, a rebellion is growing against a dictatorship led by The Azgad and their desire to rid the world of magical entities. Enmity between the two opposing groups is growing with dangerous promise. Meanwhile, Maia wakes up to find herself abducted, with no idea that a prophecy is beginning to self-fulfil and that a refugee from the North may be the key to her survival. Wow, what a fun little book! At only 270 pages, Enmity is definitely a quick read, and it was full to the brim of beautiful imagery and fun characters. My absolute favourite thing about this book though, is it’s setting. After main character Maia escapes The Azgad, she finds refuge within a camp of dissidents. The camp is set in a forest and to avoid detection, it’s inhabitants live in tree houses, and the way the homes are described is just stunning – think gorgeous foliage, lots of fairy lights and hammocks. 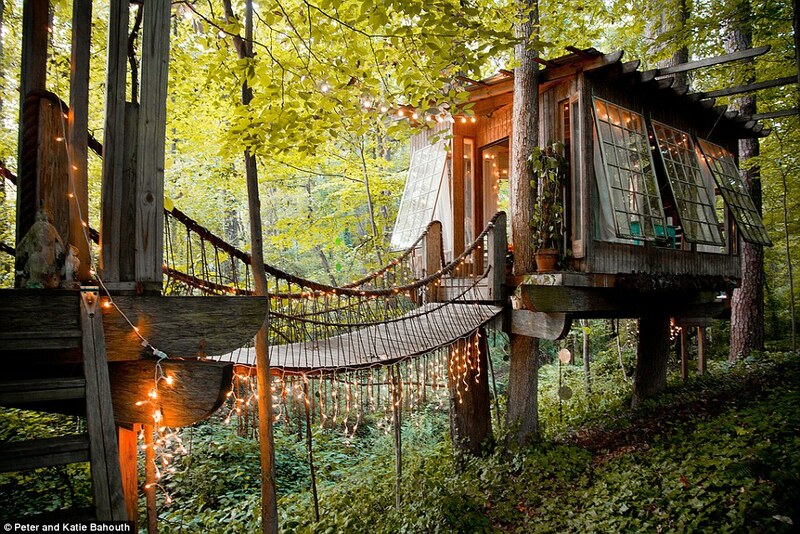 Since reading Enmity, I haven’t been able to stop daydreaming about running way to live in a tree house! Or at least going on a holiday to one. This is the kind of imagery the book conjured up for me . . .
Another thing I love about Enmity is it’s main characters Kai and Maia (plus her sidekick, Pyros). Kai is such a sweetheart, and I really enjoy how he’s portrayed as more of an intellectual than a fighter; he’s a nice change from the serious, brooding male leads you usually find in fantasy. And Maia was just plain fun. Despite the fact that she’s in mortal danger for a fair chunk of the book, she maintains a positive attitude and is constantly giggling. She’s also quick to get into combat training and by the end of the book she’s well on her way to becoming a badass heroine. She even has her own magical pet to help focus her powers – a half phoenix, half dragon named Pyros. There wasn’t much that I didn’t enjoy about Enmity, though I do wish we learned a bit more about Than and the Azgad. It’s clear they’re a violent and evil group, but I would have liked to read more about their philosophy and origins. Ultimately though, Enmity was a great read and I can’t wait for the sequel!